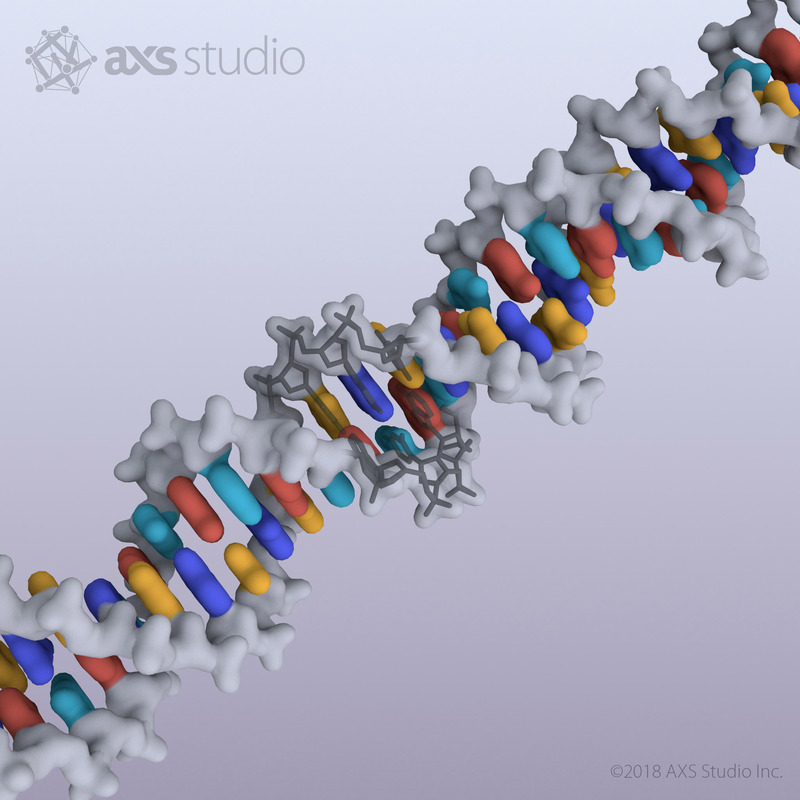 A simple image search of ‘DNA’ or ‘DNA structure’ makes it clear that there are myriad ways, both inaccurate and accurate, of representing DNA in science illustrations and medical animations. 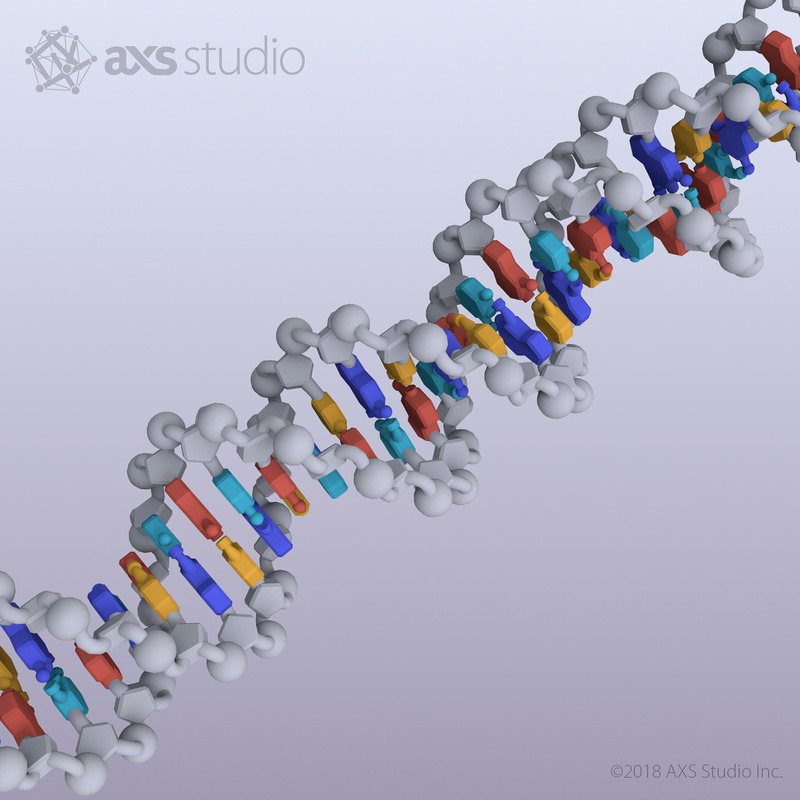 For a Virtual Reality (VR) science game AXS Studio is developing internally, called Guardians of the Genome, we had the challenge of meeting various requirements in our own depiction of the ubiquitous double helix. Science and learning requirements: The game features DNA mismatch repair, with players (as nanobots) identifying incorrectly paired bases, excising them, collecting correct bases, and ligating them in place. 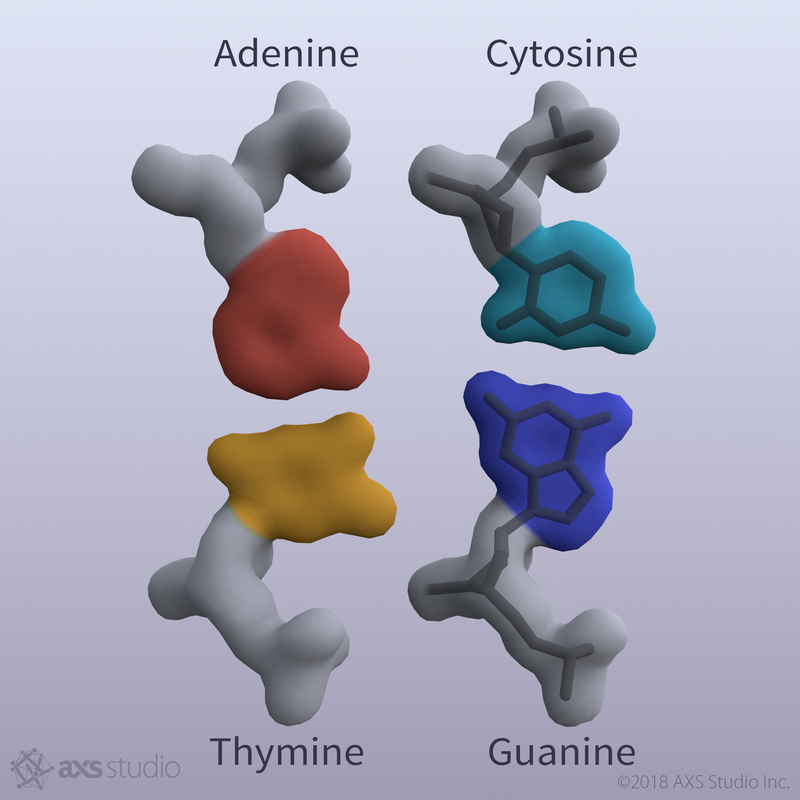 We want players to gain an intuitive understanding of how DNA is constructed: i.e., two strands, each with a backbone and a sequence of bases; each base paired to a base on the opposite strand (A with T, and C with G). The bases should be easily recognizable so that mismatches can be identified. The DNA should be accurate with respect to the 3D spatial arrangement of components ( and handedness). Nucleotides showing Watson-Crick base-pairing using a geometric representation Stylistic requirements: DNA is a complex molecule, and we wanted to provide enough information without overwhelming the player with visual detail, as the expansive and immersive VR environment is already visually rich. In contrast to the players’ mechanical nanobots and robot tools, we also wanted the DNA to feel natural and part of a living organism. One proposed representation was a geometric style, demarcating the parts of the sugar-phosphate backbone and bases, including hydrogen-bond donor/receiver components to make the base-pairing mechanism clear. Typically geometric shapes are reserved for simple 2D illustrations of DNA, and are often a student’s first introduction to the building blocks of DNA. 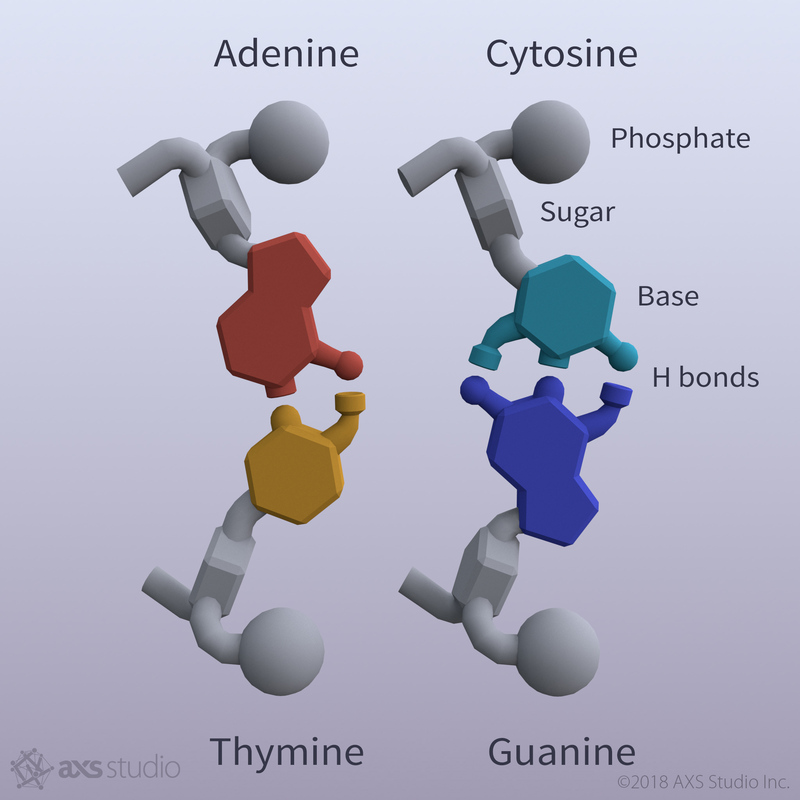 A 3D version of this style may help clarify the components of a nucleotide and the method of base pairing, however the various components in both the backbone and the base resulted in high visual complexity, particularly when viewed as a full double-helix, which might hinder the ability to assess each base (and base pair) as a single unit from a distance. Furthermore, there was some debate about where the representation sat on the stylistic spectrum between “mechanical” and “organic”. The geometric style ultimately placed visual emphasis on structural features that were less important to attend to during the identification stage of gameplay. So we went back to the drawing board and thought about how, as the objectives of the user change throughout the course of the game, so must the direction of our visuals. For identification, we arrived at a smoothed surface representation, where from a distance, we let color be the primary differentiator between bases. We also wanted to help players appreciate how the backbone connects the bases together, so we added a stick representation of atomic bonds which appears inside the surface representation at key points in the gameplay, during excision and ligation. We feel these two representations combined fit our various requirements. Do you agree? In the end, there’s no single best style of DNA, and even in a single project, sometimes multiple representations are beneficial. As long as the outcome is science-based and driven by learning objectives, there are plenty of styles to explore.